Retailers are upping their investment in digital in-store experiences, be it through click & collect, interactive experiences or store-mode features in their mobile apps. Often, such initiatives are closely tied to their future viability as shoppers continue to reward retailers that successfully combine online and offline into a seamless experience. However, this mashup of digital + physical - that comes so naturally to shoppers - is still a foreign muscle movement for most retail organizations. 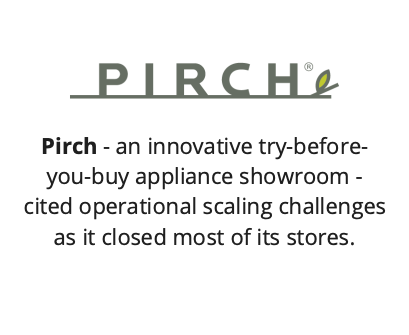 From digital upstarts such as Pirch to established retailers who made it (Walmart) and those who didn’t (Sears) - everyone has found out the hard way that you can’t just stick technology into the store. 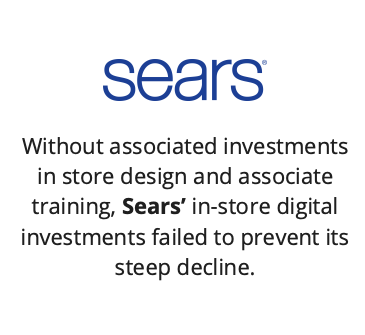 Digital investments in the store alone do not guarantee success. How, then, do retailers ensure their intent translates to success? We analyzed over a hundred successes and failures, and gleaned five key imperatives for successful in-store digital experiences. We published our findings recently as an eBook in partnership with InfoVista. I also sat down with a few invited experts to discuss our analysis and dive deeper into what each of the requirements means for retailers. Change how you value stores, and redefine how the success of in-store digital experiences is measured. Giri. Stores are no longer just glorified warehouses whose success can only be measured by a standalone P&L. There are new economic models for the store , and any in-store digital investments must be planned and measured accordingly. Rebecca. The emergence of pop-ups and showrooms illustrates how the value of the store is moving from being purchase centric to experience centric. Ricardo. Customers are looking for clarity of purpose from their favorite retailers and brands. Shelley. 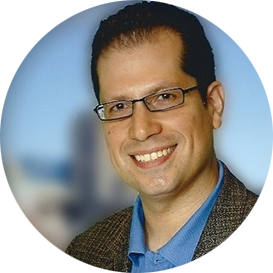 Traditional retailers struggle with hierarchical organizational structures with deep muscle-memory that is all about the local optima. Digital natives such as Warby Parker on the other hand can double down on their clarity of purpose with a more streamlined organization structure. Avoid falling into the me-too trap. Focus on what matters most to your customers. Giri. “Digital” can mean very different things to competitors within a category. 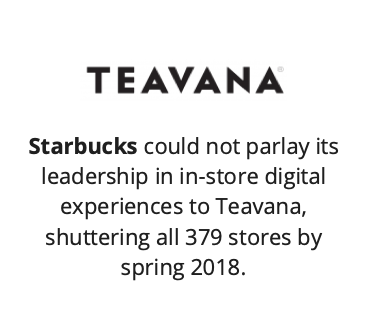 For Starbucks digital is about deepening loyalty and reducing friction from the order process. For McDonald’s digital is about tapping new markets (delivery) and improving its speed-of-service promise. Rebecca. Direct-to-consumer brands such as Outdoor Voices are leading the charge when it comes to being clear on who their shopper is, and then designing store experiences around that clarity. Shelley. 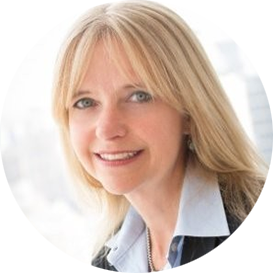 It is critical for retailers to step back, analyze their shopper’s journey, and know where specific experiences fit in. As importantly, they need to be more specific about how these experiences will drive business value. Ricardo. Can’t lose sight of the fact that customers have to be at the center of your digital strategy. Not every imperative is going to matter to your shopper. Very important that you not be overwhelmed or distracted by the latest shiny object in the room, and remain focused on what matters most to your shoppers. Redesign processes to align with digital experiences. Giri. 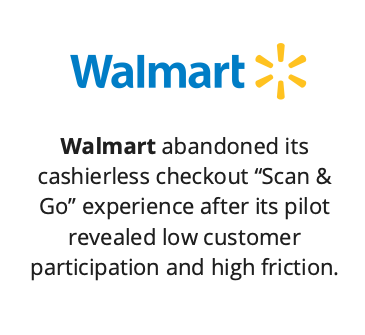 Inadequate change management is the death-knell of in-store digital experiences. Rebecca. Coach / Tapestry has done a great job of taking out fixed checkout registers and enabling a more fluid in-store experience. This took a lot of back-end process and systems change along with associate training. Shelley. Retailers must apply Digital Thinking to process redesign. For instance, let’s certainly make it easier for shoppers to return, however let’s also use digital to reduce returns altogether. Ricardo. Operational readiness is the lynchpin of successful implementation. 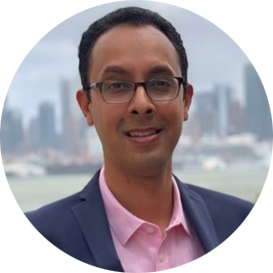 Retailers must lay out in detail all the inter-dependencies of an experience, and make sure all bases are covered, especially legacy systems and infrastructure that may need updating to support the experience. 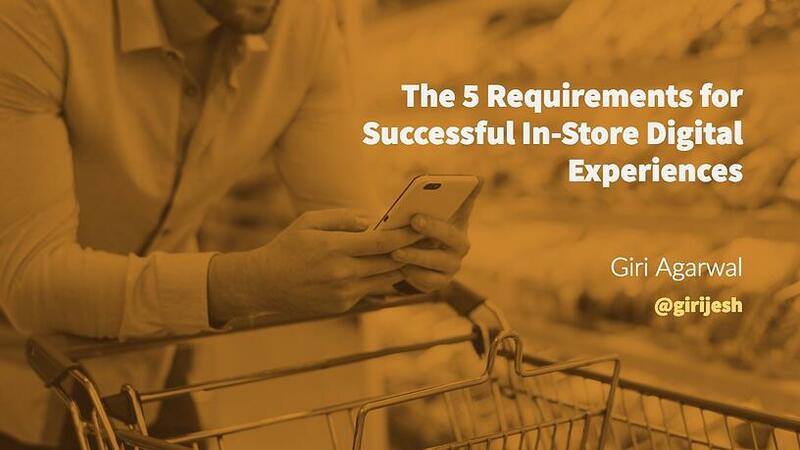 Ensure store teams are adequately trained and prepared. Giri. A majority of retailers are only paying lip-service to empowering their frontline workforce even though the business case for doing so is pretty darn clear. Rebecca. I’ve seen some improvement on that front - minimum wage going up, more software available to associates and the power of sensor-based technologies, but there is still a long way to go. Shelley. The knowledge deficiency gap has reduced a bit. Retailers must arm associates with tools that help them do their job better, but also train them on the technology (e.g. consumer mobile app) that shoppers use. Ricardo. Dixons Carphone has done a great job at identifying (and fixing) why its associate mobile enablement initiatives weren’t producing the results they wanted. By fixing issues such as training, reliability and performance of WiFi and user experience, they saw a 40% increase in conversion from shoppers that interacted with a store associate using the clienteling app. Deliver a consistently awesome experience at scale. Giri. Making a promise and then failing to keep it is worse than not making one at all. Once retailers launch a digital in-store experience, they have to make sure that it works flawlessly at scale. Rebecca. If the culture is on-board with all the changes that will be required to deliver on the intended experience, then you can make the promise and keep it more often than not. Shelley. Two-way communication with customers is one of the best ways in which retailers can co-opt shoppers into the process of scaling digital transformation. Ricardo. Not all digital in-store experiences are created equal. You have to be able to understand one’s impact on the other, as well as manage the rules around which experience gets priority under what circumstances. Your in-store network needs a traffic cop to avoid costly mishaps.